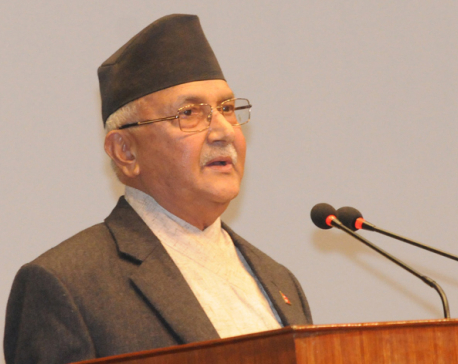 KATHMANDU, Dec 2: Prime Minister K P Sharma Oli has said that although a one-size-fits-all approach may not work in a country-specific situation, Nepal’s success in resolving a decade-long Maoist armed insurgency could serve as a good example for other countries passing through similar conflict. 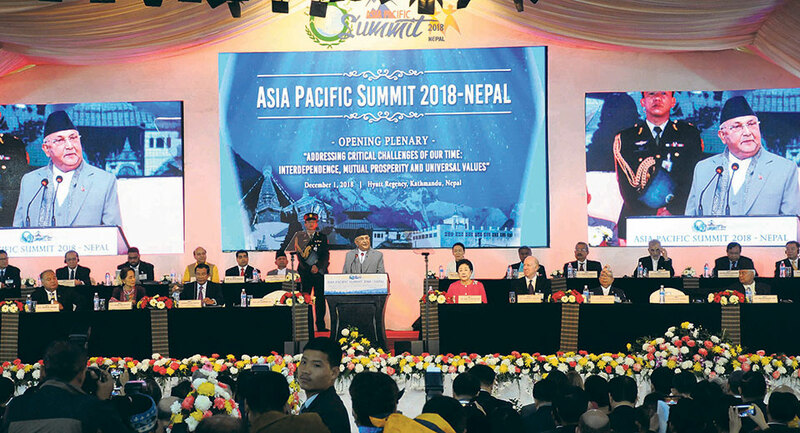 In his inaugural address at the two-day Asia Pacific Summit 2018 that kicked off in the capital on Saturday, Prime Minister Oli said political actors in Nepal had set the example that through dialogue, understanding, mutual respect, compromise and accommodation even an armed conflict could be successfully resolved and the supremacy of ballot over bullet established. The prime minister said that Nepal’s recent political transformation had been a monumental achievement in its recent history. “Equally successful has been our unique peace process, launched in 2006...we have been able to fundamentally conclude the peace process and leave behind one of the most difficult periods in our history,” he said. Oli said that Nepal had embarked on a new era after the promulgation of one of the best constitutions in the world through an elected constituent assembly. Putting forth his views on the Summit theme-- Addressing Critical Challenges of Our Time: Interdependence, Mutual Prosperity and Universal Values -- Oli said that climate change had upset the organic linkage between the mountains and the seas, putting human life in jeopardy. “The irony is that the severest burden is felt by those who did not commit any fault. This is unacceptable. So, we very much emphasize the need for effective implementation of a climate justice principle,” the prime minister further said, while stressing the need to forge active partnerships between governments, the private sector and diverse social groups for the sake of mutual prosperity. Also speaking on the occasion, leaders from different countries stated that peace and development were two sides of the same coin and maintained that ending poverty and starvation was a must for global peace. They underscored the need of cooperation, mutual trust and partnership to face various other challenges that the world faces today such as climate change, terrorism and economic inequality. State Counsellor of Myanmar Aung San Suu Kyi stressed the need to make collective efforts to address various global challenges such as disasters, terrorism, hunger, poverty, migration and injustice. Arguing that the world today is characterized by uncertainty, trade tensions and power competitions, Suu Kyi noted that the challenges had only grown as the world became increasingly interdependent and inter-connected with advancements in information technology and globalization. Vice-President of the Philippines Maria Leonor Gerona Robredo said collective efforts of all stakeholders were necessary to bring peace in the world. “Collaboration can be the main agenda of peace and development. We have been stressing on it,” she said sharing her experience. The vice-president said that trustworthy partnership, co-operation and determination were a must for coping with poverty, illiteracy and terrorism. Prime Minister of Cambodia Hun Sen, President of the Republic of Nauru Baron Waqa, Governor-General of Tuvalu Iakoba Taeia Italeli, President of Samoa Afioga Tuimalealiifano Va’aletoa Sualauvi II, former Indian prime minister H D Deve Gowda and former Pakistani prime minister Yusuf Raza Gilani also shed light on various critical challenges facing the world today and ways to tackle them. Co-founder of the Universal Peace Federation (UPF) which organized the Summit, Dr. Hak Ja Han Moon, said women in Asia had been protecting social norms and values. Expressing concern over family disintegration and social disorder, she said that the role of women is important in order not to let the family disintegrate. Chairman of UPF International Thomas G Walsh said that this kind of Summit holds important significance for addressing current challenges facing the world. Various speakers shared their thoughts at two different sessions later in the day on the role of parliamentarians, faith-based organizations and civil society in addressing critical challenges before the world. The second day of the Summit will dwell on the theme of tackling climate change, the role of media in addressing the critical challenges of our time, peace initiatives and peace projects around the world. According to Universal Peace Federation (UPF), the Summit has brought together over 1,500 participants from 45 countries across the Asia-Pacific region. Participated by a number of high-profile political leaders including current and former heads of state and government, the Summit will conclude on Sunday, issuing a Kathmandu Declaration for peace and cooperation.